In the Currency Strength table, the NZD was the strongest currency while the JPY was the weakest. There were some significant changes last month with the AUD and CAD gaining 4 points strength. The JPY lost 4 points and the CHF 3 points. The other currencies remained around the same level of last week with a maximum change in the strength of just 2 points. 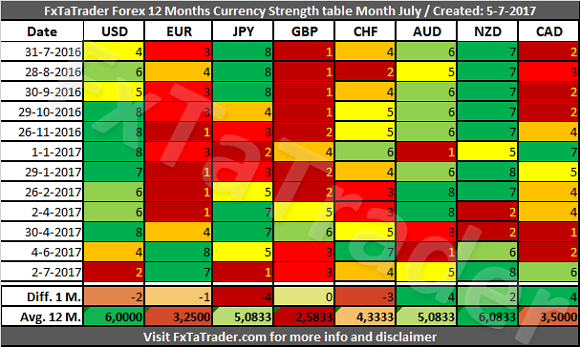 The 12 Months Currency Strength and the 12 Months Average are provided here below. This data and the "12 months Currency Classification" are considered for deciding on the preferred range. Because it is not ideal nor desired to change the range for a currency every single month, we perform several checks to avoid this. First of all the strength over a period of 12 months. See each row for more information. Then the 12 months average, see the last row called "Avg. 12 M."
The number of months that a currency is stronger than another currency can also be evaluated. Neutral: JPY, AUD, CHF. The preferred range is from 4 to 6. When looking at the Average 12 M. Score the NZD is the strongest of all and the GBP the weakest. The currencies are grouped together around a level which makes clear to what classification they fit best. It is clear to see in the Avg. 12 M. values to what groups the currencies belong. This is not the case for the CHF, it has now an Average 12 M. Score between the Neutral and Weak currencies. It is closer to the Neutral currencies and is now classified as such. This month we take a look at the Strong currencies and the JPY which has changed from Strong to Neutral. 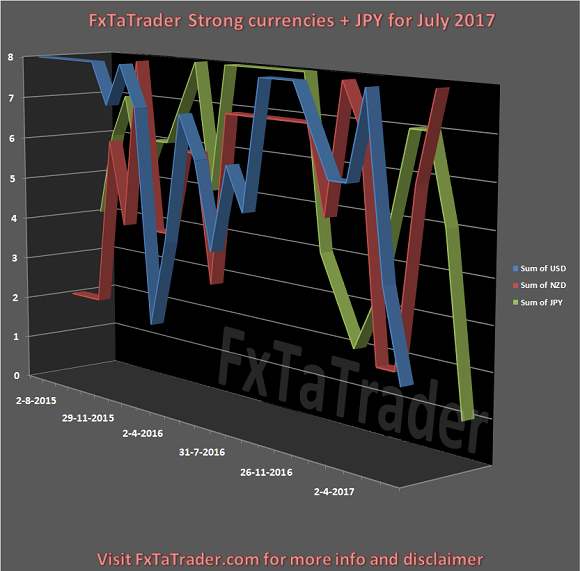 The USD, NZD and JPY are most of the time at the Strong and Neutral range with sometimes having a dip to the Weak range. This is currently the case for the JPY. The USD is also getting weaker in the last 2 months but has still an Average 12 M. Score in the range of the Strong currencies. If it stays this weak it may also become a Neutral currency. The NZD is just recovering from a dip and showing good Scores in the last 2 months. It is now back again in the Strong range. 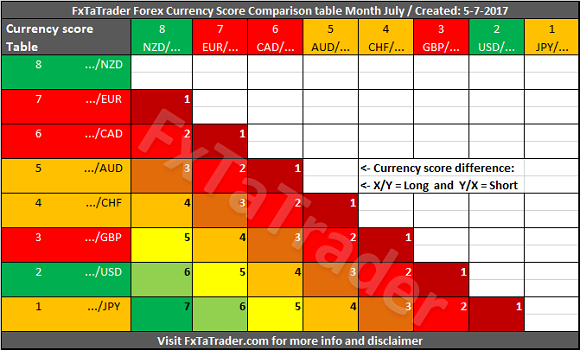 Below you can see the Monthly Currency Score Chart with the 24 months' data as a reference. The Forex Currency Comparison Table compares each currency with its counterpart based on the Currency Score. For more information about the currency Score of this month, you can read the article "Forex Ranking, Rating and Score" which is published every month together with this article. By using the comparison table directly below you can get a view without the volatility and statistics as opposed to the "Ranking and Rating list". Only the strength of each currency against the counterparts is analyzed by using the Technical analysis charts of the 3 Time Frames that are also used for the "Ranking and Rating List". The information is published once a month and be aware that rates change during this period. The mentioned scores also change and different opportunities may show up. There are many ways to follow the rate changes. This can be done e.g. by looking at the charts and checking e.g. the Ichimoku and/or MACD in the Weekly and Daily chart. There are also many tools, apps and websites where the movement of trading rates of currencies is shown in different automated ways. This may be in pips or through percentage differences or by comparing the values of indicators like the RSI, Moving Averages, MACD, Ichimoku etc. On my blog a Heatmap is available that can be of use also. The comparison table provides a way to compare currencies from a longer term perspective of 12 months and also simultaneously taking the current trend into account. By coloring the currencies in the X and Y axis according to their Classification we can show what the best combinations are. In doing this we apply 2 rules to make it clearer. The points here below have been updated on 5 July 2017 to provide more trading opportunities. It is for that reason more aggressive and the Charts are very important to support this approach. First of all better-classified currencies in combination with weaker-classified currencies can always be traded after a pullback. A Currency Score difference may be negative. That is why a trade can take place only after a recovery and the main trend being confirmed again. The difference between point 1 and 2 above is that the long trend is not clear with 2 equally qualified currencies. For that reason, the Currency Score difference cannot have a negative difference. Third, only Neutral currencies are Approved against a better-classified currency when there is a Currency Score difference of at least 4 in the current month. This may be when there is a clear reversal and the chart is showing a new trend with good entries in the new direction. The difference between point 3 and the previous 2 points is that with point 3 a reversal in the whole market is possible when looking at all the currencies together. This gives a better chance when a trend reversal takes place compared to point 1 and 2! By preference, each currency should be traded as far apart from each other as possible in the range from 1 to 8. However, these opportunities are rare and for that reason point 1 offers flexibility and is the best choice to trade, point 2 is the second best and point 3 is the third best choice. The classification of the currencies in question may change in the longer term. Even though currencies may be in the same classification, a currency may be in a weaker/stronger period and may even change its classification in the future. See the current classification for the coming period at the beginning of this article. These are Strong or Neutral currencies from a longer term perspective when looking at the last "12 Months currency classification". Besides this article I also use the Forex "Strength and Comparison" which is also available once a month on my blog. In that article we look in more detail at the relative position of the currencies and pairs. We will look in more detail at the interesting pairs from a longer term perspective for trading in the Weekly and Monthly chart. We will use the information from this article, "Ranking, Rating and Score", and analyze it further in more detail. It is recommended to read the page "Currency score explained", "Introduction to the FxTaTrader Forex Models" and "Statistics and Probabilities" for a better understanding of the article. If you would like to use this article then mention the source by providing the URL FxTaTrader.com or the direct link to this article. Good luck in the coming month.